A variety of hearing aids to fit your needs. Hearing loss can disrupt your social life, make driving dangerous, and interfere with many everyday life and work situations. Luckily there is a wide and diverse range of hearing aids on the market that can assist you no matter what your level of hearing loss may be. When you meet with a licensed hearing care specialist, she will conduct a series of tests and gather detailed information about your lifestyle, budget, and level of hearing loss. All of this information will help her to recommend the best solution for your individual needs. 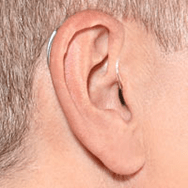 There are several great manufacturers of hearing aids to choose from—and while many have similar offerings, some are notable in their specific, unique benefits to the wearer. Using a variety of smart technologies, GN ReSound specializes in digital, wireless-enabled hearing devices that can connect to apps and stream phone calls, music, and more from the wearer’s iphone or ipad. 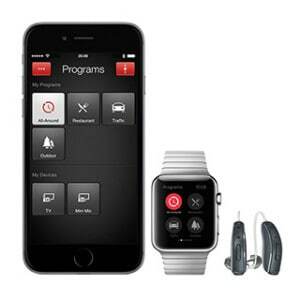 Users can also personalize their hearing experience directly through the ReSound Smart™ App. The technologies at use in these hearing aids are designed to provide wearers with an intuitive, natural and connected hearing experience. Comfortable and discreet, Phonak’s hearing aids have been designed to let you enjoy the world around you with ease. The Lyric model, for example, can be worn 24 hours a day, 7 days a week for months at a time. Phonak hearing aids in general are focused on enhanced speech understanding, invisibility, adaptability, and more music enjoyment. Lyric – The contact lense for your ears. The lyric is a completely invisible, battery-powered hearing aid that can be worn continuously for months at a time. this is a great option for someone with a mild, high-pitch hearing loss but does not provide the power needed for those with more advanced hearing loss. Comfortable and completely discreet, the lyric can also be customized by your provider to suit your exact hearing needs. Providing a huge variety of personalized options, Oticon hearing aids are a great and flexible option for anyone of any age. Their pediatric hearing aid line is focused on high performance speech understanding and meeting children’s daily hearing needs, no matter how complex the sound environment. Starkey offers a huge variety of models, from small, discreet hearing amplifiers for those with minimal hearing loss, to in-the-ear or behind-the-ear models for those in need of more advanced amplification. An American owned company, Starkey is proud to serve veterans and helpful in assisting themwith a range of hearing problems, including tinnitus. This company also offers a range of affordable hearing aid plans for people on a budget. 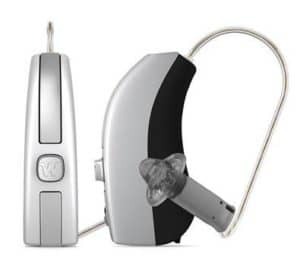 Siemens hearing aids make use of smart hearing technology and are highly adaptable and connectable to devices. These unique models can detect different hearing situations, adjust and synchronize to your individual preferences, and provide an optimum hearing experience in a variety of situations. Widex hearing aids allow you to experience a wide range of different sounds, from the very loud to the very quiet, so you can hear in the most natural way possible. Unwanted background noises are filtered out, while still allowing for soft pleasant sounds, such as rainfall or a soft breeze. They can be customized to your exact hearing loss and are designed to be comfortable so that you can enjoy supreme hearing in any environment. With excellent wind noise reduction capabilities, this brand is ideal for active people who love to spend time in the outdoors. Unitron provides user-friendly hearing aids in a range of performance levels, from basic to premium, which you can choose from depending on your specific needs and lifestyle. 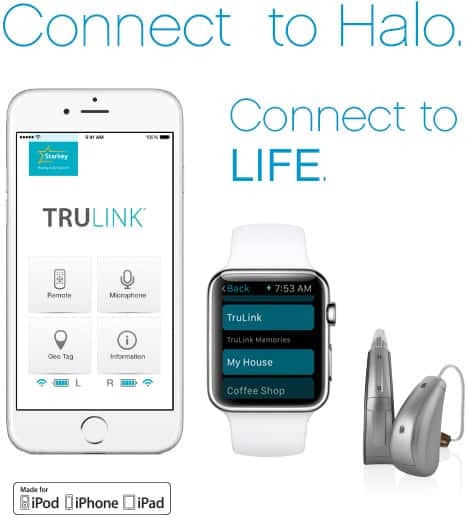 The company also offers a program in which wearers can take the hearing aids on a trial run in their home and work environments before purchasing to make sure they have selected the appropriate model. They manufacture a number of hearing aid accessories as well, which can make the wearer’s hearing experience even more satisfying. Bay Area Hearing Care Professionals offers a diverse selection of hearing aid styles. Your hearing care specialist will help you to choose a style that is suitable based on your level of hearing loss, your lifestyle, and your aesthetic preferences. 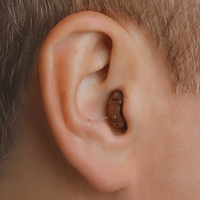 This is the smallest, most invisible hearing aid. 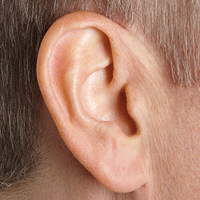 It fits deep within the 2nd bend of the ear canal, and would be an excellent choice for individuals with mild to moderate hearing loss who would prefer the device not to be seen in any way. These hearing aids use the latest digital technology and are custom-fitted to your ear canal for maximum comfort. 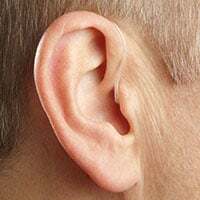 The deeper position of the hearing aid (and closer proximity to the eardrum) also allows for several technical advantages, such as improved acoustics, volume and directionality (being able to tell which direction sounds are coming from). This hearing aid is also placed in the ear canal, though it will not be as deep within as the IIC model. It is also slightly larger than the IIC, but it is still a very discreet model and should still be near-invisible to others. The placement inside the ear canal minimizes wind noise and other sound interferences, while the slightly larger size allows the device to contain more circuitry for options like Bluetooth connectivity. CIC’s often have a volume control button which can be reached manually, while IIC wearers will need to use a remote or wand for this purpose. The CIC style is a great choice for consumers who would like increased functionality but would still prefer the device to be as discreet as possible. 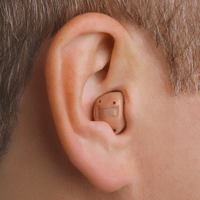 Both the CIC and IIC models will need to be removed to have their batteries replaced more often than other, slightly larger styles of hearing aids, and are therefore more practical for people with good dexterity. The In-the-Canal style is larger, and much easier to reach and manually control, than both the CIC and IIC models, but it is still quite discreet. The device will be custom-fitted to your ear canal, and a small portion of the device will show in the outer ear. Along with the CIC and IIC styles, ITC hearing aids are suitable for those with mild to moderate hearing loss. ITC’s tend to have a longer battery life than the smaller devices and are a good option for consumers who are looking for increased comfort, accessibility, and convenience. In-the-Ear hearing aids are completely contained in a custom-molded casing that fits into the ear. Although they are visible within the ear, they are available in a variety of skin tones which can make them less noticeable. 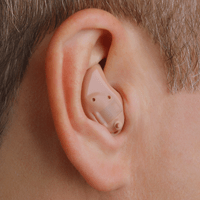 ITE’s are also available in a slightly smaller “half” option—these devices only fill the lower half of the ear. Both full and half ITE models are appropriate for mild to severe hearing loss, are easy to handle, and have easy to access controls. An ITE device is a great choice for those in need of increased power, and even more convenience and accessibility than an In-the-Canal aid can offer. Receiver-in-Canal hearing aids provide the increased power and amplification that is a necessity for those with fairly severe to severe hearing loss. 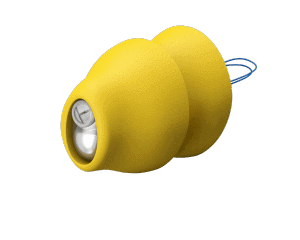 They are similar to Behind-the-Ear models in that the circuitry are battery component is worn behind the ear, but RIC’s have the added advantage of a small receiver, or speaker, that is worn inside the ear canal. These models are generally more discreet and smaller than standard BTE’s, and are quite durable in that there is no tubing which can become damaged by moisture. This is a practical choice for those seeking a powerful hearing device with a long-lasting battery and a fairly discreet appearance. Although there are many benefits to smaller, more modern hearing devices, a traditional Behind-the-Ear hearing aid may still be the best choice for some people. The lack of electrical components in the ear canal is an advantage for those with chronic ear problems or who experience ear drainage, and this is also the most unobtrusive style as it leaves the ear canal completely open. 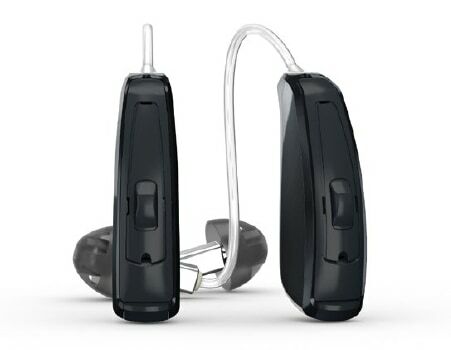 The easy to operate controls are ideal for those with limited dexterity, and the power and amplification capabilities of a BTE device make it suitable for all levels of hearing loss, from mild to profound.